When I’m making a meal for someone for the first time, I tend to keep the big things familiar and give the small things my own special spin. There are fewer things more familiar than roasted chicken. It’s comfortable and inviting. I’ve mixed things up a little bit by adding persimmons to the roasted potatoes underneath. Persimmons are these funky little fruits that come around in the fall. They are small, orange, and tough. Baking or roasting them breaks them down a little, and creates a sweet compliment for the fresh thyme and rosemary in this dish. potatoes. 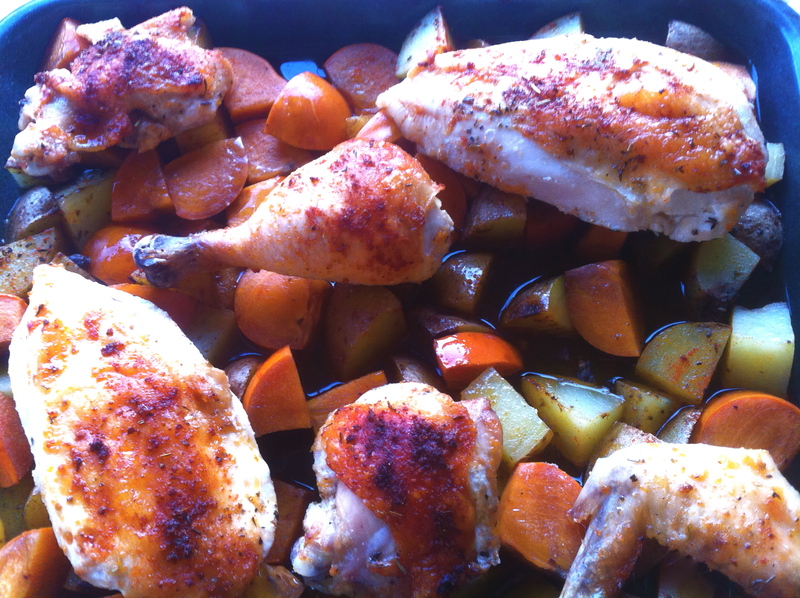 Lay chicken in a baking dish; season well with salt and pepper. To make the roasting butter, combine butter and oil with orange zest and juice, thyme, paprika, and minced garlic and shallot. It should form a paste. Spread evenly over the chicken set aside. In roasting pan, combine the potatoes, persimmons, onion, and herbs. Toss with olive oil to coat and season with salt and pepper. Spread into an even layer in the roasting pan. Lay the roasting rack on top of the potatoes. Place the chicken skin-side up on the roasting rack. Bake in the oven for 50 minutes, or until the chicken is cooked completely through. Serve the chicken on top of the potatoes and persimmons, adding a bit of the pan juices on top of the chicken for extra flavor.